It Sounds Silly, Chunky Move. Photo Jeff Busby. ADAM WHEELER’S IT SOUNDS SILLY IS THE FOURTH PRODUCTION IN THE NEXT MOVE, A SERIES OF DANCE PERFORMANCES BY YOUNG CHOREOGRAPHERS, COMMISSIONED AND PRODUCED BY CHUNKY MOVE. AFTER BYRON PERRY AND ANTHONY HAMILTON’S I LIKE THIS, MICHELLE HEAVEN’S DISAGREEABLE OBJECT, AND STEPHANIE LAKE’S MIX TAPE, HERE IS ANOTHER SHORT, DRAMATURGICALLY MODEST WORK. Next Move productions have so far all been different sorts of ‘dance in a box’ products, armed with extraordinary clarity of vision and purpose, as such being useful as mini dance primers. Positioning It Sounds Silly outdoors, on an important pedestrian nexus point adjacent to Melbourne’s Flinders Street Station, not exceedingly past the peak hour, was therefore a constructive intervention. At its primary level, it made It Sounds Silly work as a particularly astute piece of public art, one that presented a resplendent image of Australian youth back to its people. For every dozen spectators rugged up in the ad-hoc auditorium, there clearly to support a son or daughter performing, at least two office workers or urban joggers stopped in their tracks or looked momentarily over their shoulders, entranced. 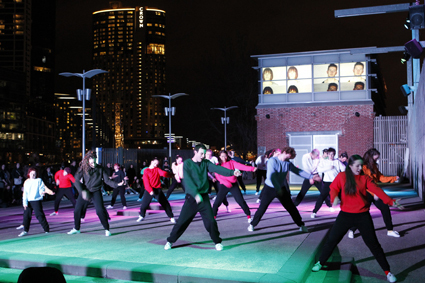 Robin Fox’s large-scale video installation, Benjamin Cisterne’s equally elaborate lighting and the tangible charm of the 28 young dancers constituted a spectacle that combined simplicity, beauty and innocence as well as sense of community and purpose—as if the city had acquired a very well behaved, underage, open-air disco. Using as its starting point the dancers’ childhoods, It Sounds Silly builds as a series of images of the strange things the performers believed when they were young. It quickly progresses from humorous (“when I was little, I ate a lot of cheese, because I thought it would make my voice more squeaky”) to linger on the frightening. At one memorable point, the dancers line up from the oldest to the youngest, each introducing themselves and one of their fears. The fear line-up changed between performances, reflecting the dancers’ momentary preoccupations, but a clear pattern was nonetheless established: quick descent from fully formed relationship and identity anxieties of the 20-somethings to more inchoate fears of the younger kids—falling, social embarrassment, monsters under the bed, right down to marrying a woman named Helen if one’s surname is Pellin. The degree of metaphor varies, from mime-like literalisation, via swaying monsters built of clusters of dancers, to complex compositions teetering on formlessness, in which phantasmagorias of childhood are represented as half-image, half-mood. The latter are the most successful: in their labyrinthine, repetitive, playgroundish, unsurveyable synchronicity, they manage to simultaneously evoke the work of two Flemish masters: Brueghel’s ethnographic figuration and Bosch’s conceptual fantasies. Close up, these semi-trained dancers perform with physical elasticity, imprecision and undeniable freshness—they are predominantly interesting as bodies with strong, unschooled presence. However, from further away, it is possible to appreciate the large-scale intelligence of the stage imagery, and the performance reveals that, just like Bosch’s The Garden of Earthly Delights, it is much more than a mere jumble of intriguing detail. Wheeler’s choreography, respectful of the disorientation in time and space native to a child’s worldview, adopts composition rules that are thus properly pre-Copernican. A certain kind of framing is crucial to the enjoyment of this work. While It Sounds Silly is hardly groundbreaking, it is coherently conceived, intelligently plotted and courageously executed. As a work based on the physical and mental qualities of its young performers, it is rigorously truthful to its material. First published in RealTime Arts, issue #105, Oct-Nov 2011, pg. 16.